Call 1.800.430.6536 to speak with an applications engineer. Tensile Testers perform tension or tensile tests on materials and products.Tensile testing helps select materials and ensure quality for engineering applications. In addition, tensile properties can predict material behavior under forms of loading other than tension. Material strength is of primary concern. Strength may be measured as stress necessary to cause plastic deformation or maximum stress the material can withstand. Material ductility measures how much it can be deformed before it fractures. 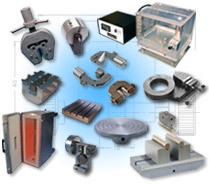 Ductility is included in material specifications to ensure quality and toughness. Tensile tests are the most common material strength test and measure properties such as yield strength, modulus, ultimate tensile strength, possons ratio, reduction of area and elongation to failure. Specimens are gripped in multiple ways including mechanical clevis grips, threaded grips, vise action, hydraulic action and air grips. There are many standard test methods: ASTM E-8 (metals), ASTM D-638 (plastics), ASTM D-412 (rubber), ASTM D3039 (polymer matrix composites). ASTM D638 determines flexural properties of plastics, high modulus composites and insulating materials.material tensile tester price list tinius olsen Composite materials. Sintech MTS machine wire tensile tester united hydraulic universal tester. 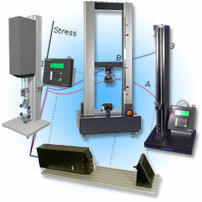 ASTM tensile tester for peel testing and tension compression. Used ametek hunter tensile tester ats analog auction avery automatic baldwin.Tensile tester equipment fixtures film hair lease and other tensile tester companies compression clamps capstan tools. Buy low cost low force to build calibrate cheap desktop chattilon compression tensile testers. Dillon fabric tensile testers for fiber film and fishing line. Used tensile testers for sale. Grips and grab tensile testers. Horizontal hounsefield tensile testers. How much is an? How does a tensile tester work? tensile testers are better than tensile test machines. 1101. tensile tester model is better than jj intruments lloyd. Just like material tensile tester is a mechanical tensile testers. Metal tensile tester, medical device tensile tester and metal tensile tester also. Mini tensile and micro tensile testers are small tensile testing machines. MTS tensile testers and Monsanto are qtest. Scott Satec rubber tensile tester second hand. Steel shimadzu tensil testor. Tensile tester accessories apparatus auctions and astm.